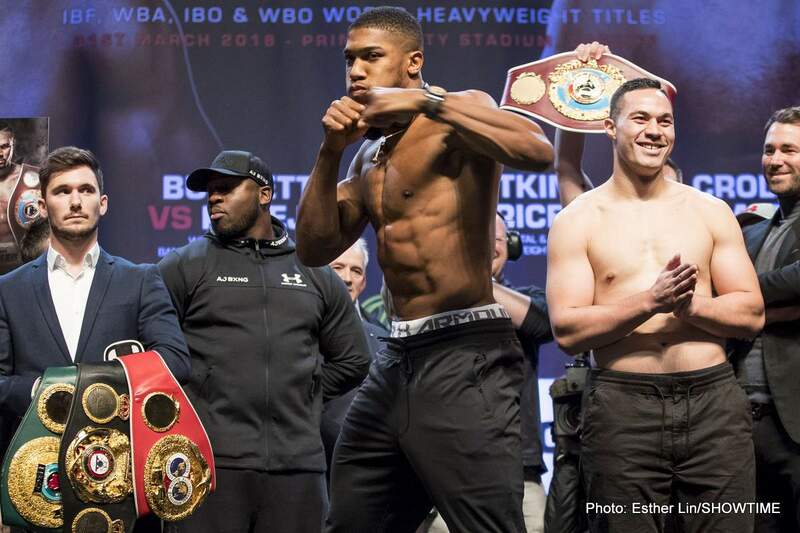 Anthony Joshua has told anyone who will listen, or who is listening, that he is focused on one man and one man alone right now: Joseph Parker; the man he will face in less than 36 hours from now in Cardiff. But everyone, it seems, is unable to stop talking about what might happen next for a victorious Joshua (and his promoter Eddie Hearn is predicting how a “fired up AJ will stop Parker inside six-rounds”). The fight everyone of course wants to see is a huge unification showdown with WBC king Deontay Wilder, but this one may have to wait, maybe until 2019. So who might AJ fight next, providing he gets past Parker, who, we must not forget, is equally fired up and determined to win? Alexander Povetkin, who faces perceived soft touch or, in the words of one publication “sacrificial lamb,” David Price on tomorrow’s under-card, is very much in the frame as far as being Joshua’s next possible foe. If (or when in the opinion of the Price doubters, and there are many) Povetkin wins tomorrow, he will retain his NO-1 ranking with both the WBA and the WBO, meaning he could indeed fight AJ next. How would fans react if Joshua, having beaten Parker, then fought Povetkin – in either Russia or in the UK? This is what we might get, and not that massive unification between AJ and Wilder. Who might Wilder fight next if it’s not Joshua – Dillian Whyte maybe, as Hearn wants? Dominic Breazeale perhaps? If so, chances are fans will be far from happy. Joshua-Wilder needs to happen sooner rather than later and any other match-ups that take place in the meantime will be unable to avoid being looked at as disappointments. Next boxing news: The Nevada Commission gets tough: Canelo could be suspended for a year – can the Mexican star’s career ever fully recover?